The band has released four records, Folk the World Tour; a self-titled album, Flight of the Conchords; an EP, The Distant Future, which won a 2007 Grammy for Best Comedy Album, and a sophomore effort for Sub Pop, I Told You I Was Freaky released October 20, 2009. Jemaine Clement has appeared in 2006 television commercials for Outback Steakhouse in the U.S. This advertising campaign was launched during Superbowl XL. He also narrates the world famous in New Zealand television commercials for L&P. 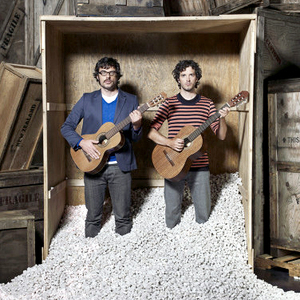 The duo currently stars in their award winning television series, also entitled "Flight of the Conchords", which began on the American television channel HBO in June 2007. Its first season had 12 episodes and the second and final season - which began in January 2009 had ten episodes. The show features rhys darby as their manager Murray, Kristen Schaal as obsessive fan Mel, Arj Barker as their friend Dave and Eugene Mirman as their landlord.